Food Costs > How Much Does Shrimp Cost? Caught in diverse bodies of water across the globe, both fresh and salt, shrimp will normally be found at the surface of the water, feeding. Known to be high in protein and calcium, shrimp can be eaten raw, fried or throw into one of the thousand recipes found on the Internet. On average, fresh shrimp can vary anywhere from $6 to as much as $25 per pound. The costs will depend on the type of shrimp you want to purchase, where you purchase it, where you live and the current market conditions. Refer to our table below to see what most popular types will cost. The Fisherman’s Cove, an online seafood market, offers fresh Louisiana shrimp for close to $7 per pound, plus shipping. Inside a pound, the website claims you will receive about 9 to 15 in an order. At Costco, for instance, a 21/25 tail-on frozen bag of shrimp retails for about $18. At most major grocery store chains, such as Walmart or Kroger, shrimp will be sold in a few ways. In the frozen food section, it can be found already cooked in frozen bags, with or without the tail, commonly in one to two-pound packages. It can also be raw in a jumbo or smaller size, often found in 12-ounce bags. Overall, you can expect about 21 shrimp in one pound and closer to 15 if it were the jumbo variety. Markets may also have a seafood counter where you can either find fresh or previously frozen fish from across the world, but most of the time it will be the same frozen fish you were able to purchase in the frozen food aisle. Some shrimp may come from a farm, while some can come from a local fishery nearby. If purchased by the bag, pay close attention to the label. “16/20,” for instance, will mean there’s 16 to 20 shrimp inside the bag, but if you were to see the term “U10,” it means there’s fewer than 10 of those shrimp that make up a pound, according to Serious Eats. Common shrimp sizes you will see on labels will include small, medium, large, jumbo and colossal. As the size goes up, the less you will get inside a pound. For instance, a small bag of shrimp could have close to 50 to 80 per pound, while colossal shrimp may only have 10 in a one pound bag. 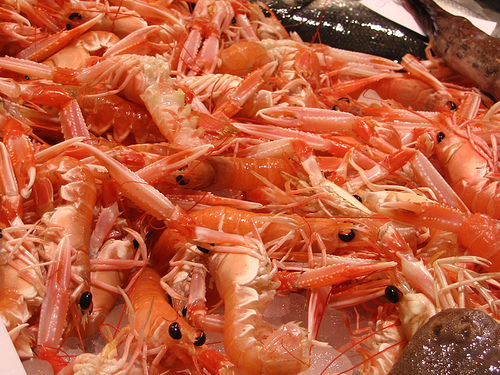 The most common types of shrimp commonly found at the local store will include brown, white, pink, tiger and rock. Brown shrimp will primarily come from the Gulf of Mexico and parts of the Atlantic coast since they like the warmer waters. These shrimp, while called brown, will have a purple-like color on its tail. White shrimp will be a bit more tender and sweet than the brown and will slightly lighter in color with a greenish-like tail. Also found along the Gulf coasts, white shrimp may also be imported from Mexico, Ecuador, China and Thailand. Pink, according to some chefs, will be the tastiest shrimp you can purchase due to its milder flavor. Pink shrimp, while called pink, can also be in a whiter or gray color, but it will be noted for its blue tail. Tiger shrimp, most commonly found in Asia, will have a brown stripe along its body and can grow up to 12 inches long. Known as the most commonly farmed shrimp on the market, they are known for its “shrimpy” flavor. Rock shrimp love the deeper waters and are found along the Atlantic coast. Equipped with a rock-like shell, it can often look like a lobster from afar, and according to some, it can have a similar taste to lobster as well. A plastic deveiner, if you want to de-vein the shrimp on your own, can cost about $10. You can also bypass this option and use a paring knife. If purchasing from a fish market online, shipping fees often apply due to the sensitivity of the shipment. To pick out the freshest shrimp at your market, there are a few things to keep in mind. For starters, smell and feel the shrimp before you buy. Fresh shrimp shouldn’t smell like ammonia nor should it have a slimy feel. If any of these signs persist, this is often a sign of decay and this shrimp should highly be avoided. According to Serious Eats, a more advanced sign is to look at the heads to see if you can notice any black spots. If visible, this is an indicator it isn’t at its peak for freshness. If buying a frozen bag, take a peek in the clear window on the packaging to see if any freezer burn is present. Most of the time, you’re better off buying the shrimp frozen since most stores will sometimes take the same bag in the aisles and allow it to thaw inside the counter. With this being said, it’s best to buy frozen and control the dethawing process. Since you have no idea how long it’s been sitting at the counter, it’s best to either purchase live fresh from the ocean or inside a tank. If you were to go this route, you would want to cook it immediately. Frozen shrimp should always be thawed out before you consume it. To do so, take it out of the bag and place inside of a bowl before running colder water on top. Within five to 10 minutes, the shrimp should be ready to go. Pay close attention to the bag if buying frozen and always make sure the “shrimp” is the only ingredient listed on the list. Some manufacturers often add additives to increase the shelf life. Shrimp, when bought without its shell, will often lose half of its body weight, ultimately increasing the costs. If you have the time to peel shrimp before consuming, it’s almost always the cheapest route to take.